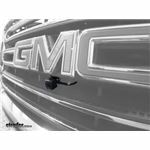 Is the Third Brake Light Camera System # RVS-770913 Compatible with a 2017 GMC Savana Van? 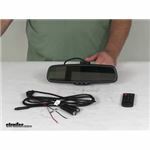 The Rear View Safety Backup Camera System - Mirror with Monitor - Flush Mount Backup Camera # RVS-772718 is a great option for your F-350. 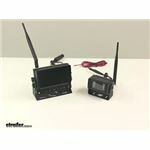 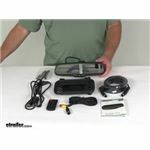 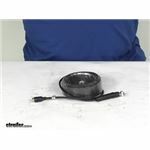 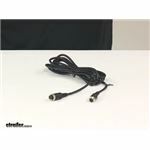 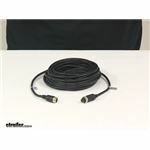 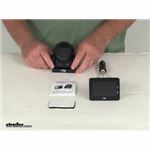 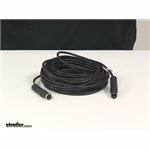 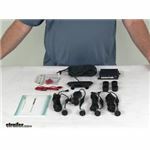 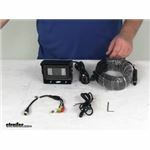 To use this system with a trailer camera, you will also need the Rear View Safety Trailer Tow Quick Connect/Disconnect Kit # RVS-213 for a single camera or Rear View Safety Trailer Tow Quick Connect/Disconnect Kit - 3 Camera Set Up # RVS-2133. 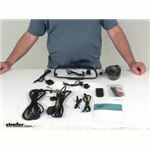 Rear View Safety Backup Camera System # RVS-770613-213 includes one camera but it can use up to three cameras total and it is compatible with License Plate Mounted Camera # RVS-0350-S. 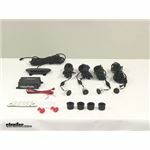 I confirmed this with my tech contact at RVS. 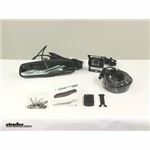 Both of these products are complete kits with mounting hardware included. 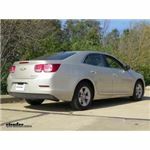 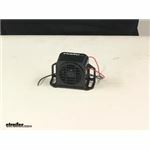 We have the part # A-200 which is an adapter that you can run a power and ground wire to and then plug into a cigarette lighter socket like you described. 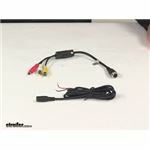 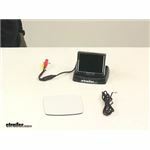 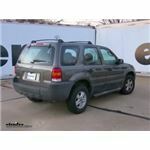 If you wanted to power the Rear View Safety Camera System part # RVS-770613-213 with this you certainly could. 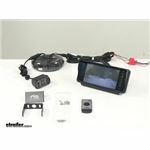 The Rear View Safety Backup Camera # RVS-2311 is FMVSS 111 rated and then for a rearview mirror monitor you'd need the # RVS-776718 which is a universal style rearview mirror monitor designed to work with the camera kit mentioned. 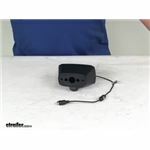 The Rear View Safety Tailgate Handle Backup Camera # RVS-F150 only comes with the camera that is installed in the handle, and a power wire. 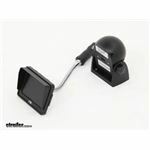 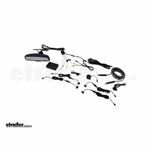 If you are looking for the rearview mirror monitor and wiring for your Ford F-150 then you need part # RVS-718F150 instead. 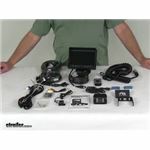 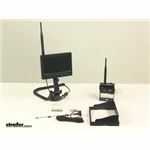 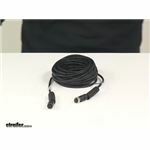 This comes with the camera, monitor, and all of the wiring that you need. 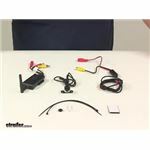 Installation details and a review video have been linked for you to check out as well. 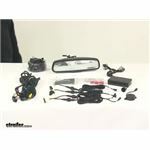 The Rear View Safety Blind Spot Sensor System # RVS-BES02 that you referenced would be a great choice designed exactly for what you are looking for. 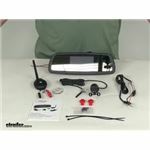 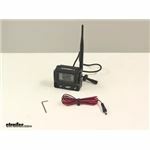 Once installed this will give an audible alert when there is someone in your blind spot and you have your blinker on. 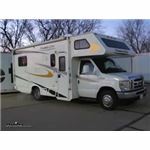 I attached pictures that have all of the dimensions for the RearView Safety Flush Mount Bracket # RVS-421 that you referenced. 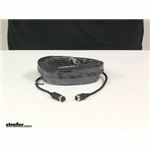 Overall it's 7.875 inches wide and 6.125 inches tall. 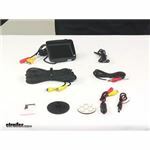 The Rear View Safety Windshield Mounting Arm for Mirror Monitors # RVS-619UM will use the metal on the windshield and then will connect to the monitor by sliding the monitor over the metal from the bottom and then turning the dial to secure the monitor position by tightening the dial to the back of the monitor.